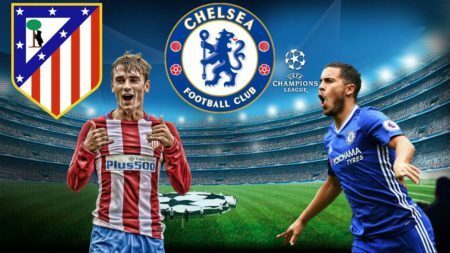 Chelsea entertain Spanish Football League side Atletico Madrid tonight at Stamford Bridge and will be hoping to do a double over the Los Rojiblancos having won 2-1 away at the Wanda Metropolitano in the reverse fixture. A win for the Blues secures top spot for us while a win for Atletico Madrid gives them a slim chance of making it to the next round provided AS Roma fails to beat Qarabag in the other group game. We take a look at Chelsea predicted lineup against a resurgent Atletico Madrid side. Belgium international Thibaut Courtois is expected to remain in goal barring any injury and will be hoping he can stop his former Sports club from scoring. Antonio Conte is expected to stick with his three at the back system but will likely make a change at the back to the team that defeated Newcastle 3-1 last weekend. Andreas Christensen is expected to remain in the heart of the defence, while Captain Gary Cahill is expected to come in to replace summer signing Antonio Rudiger on left side of the defence while Cesar Azpilicueta is expected to keep his place on the right side of the defence. A five-man midfield is expected with the wing backs offering more threats going forward. Victor Moses and Marcos Alonso are expected to support the attack and will offer more width from the right and left side of the midfield respectively, and not neglecting their defensive duties. A central midfield pairing of Kante, Fabregas and Drinkwater is expected to control the midfield after the trio bossed the midfield against the Magpies last week Saturday. The impressive duo of Alvaro Morata is expected to lead the line after both got on the score sheet in our 3-1 win over the Magpies last weekend. Belgian attacker Eden hazard will be a handful for the Los Rojiblancos defence and would be hoping to continue his fine form in front of goal having scored a brace last weekend. Probable lineup: Courtois, Azpilicueta, Christensen, Cahill, Moses, Kante, Fabregas, Drinkwater, Alonso, Hazard, Morata.